Legend of the Five Rings is role playing set in Rokugan, which is similar to Japan during the Tokugawa shogunate, but with fantasy elements. The setting features noble samurai, wise monks and mysterious shugenja (priests) that wield swords, fists, and spiritual powers (respectively) to obtain honor and fame in the honor-bound feudal setting. Each character derives from a powerful clan (Crane, Crab, Lion, Phoenix, Dragon, Scorpion, and Unicorn) each with their own motivations and agendas. The game got its start in 1995 with AEG, which released a role playing game along with a collectible card game that was fairly popular at the time (and which persisted until 2015). Fantasy Flight has acquired the rights to this rich setting, and launched things last year at Gen Con with an oriental styled parade from the street through Gen Con itself, gathering quite a crowd. Fantasy Flight is doing some pretty impressive stuff with the property, including kicking off the new card game (which is about a year old, and I’ve heard good things, but haven’t played). But more importantly for Skyland Games readers, they have been working on a new version of the RPG rules which have been in beta testing for some time now. You can download those beta test rules HERE. However, smart money might just guide you to pick up the Beginner box which just came out. I did, and I’d say on the whole it was worth it, unless you’re sure sure sure you want to play and can’t wait for the final rules to be released next year (TBD as of this article). The L5R Beginner Box is an attractive set, coming with maps of the larger region, maps of a medium sized city / village, and a map of a large castle not actually featured in the boxed set itself (but available for some online content I’ll discuss later). The game includes an adventure that presumes no knowledge of the rules or how to play, and teaches both game master and players how to play as the game continues. While theoretically that would allow you to start playing almost immediately, in reality the GM is going to need to read through the entire booklet to grasp the concepts before sitting down to run. Without giving anything away, the adventure “The Topaz Championship” is a coming-of-age ceremony for persons of the samurai caste, which includes in this case a Phoneix clan shugenja, a Dragon clan Monk, a Crane clan Courtier and a Lion clan warrior. The adventurers find themselves travelling together and form an unlikely bond when strange events occur that unite them in a common purpose. The adventure itself is not the strongest adventure out there, but does unfold the concepts nicely and provides a way to ease into more and more of the rules as you play. It starts with introducing setting and role playing concepts, then evolves into skill challenges, then non-lethal combat, then lethal combat. Each character booklet presented to each player gives a skeletal version of the rules, indications of what the symbols on the dice mean, and what various actions can be taken. A small more detailed rules-lite version of the full rules is also in the box, which allows for more nuanced play outside of the extra-lite rules in the adventure itself. The Beginner box gives us a good idea, if not a perfect idea, of what the game will look like upon release. First I should note that, though the system holds similarities to the Genesys game that is the framework for many future releases from FFG, it is not that system, which to me was a bit of a disappointment. While I have no desire to return the the days of d20 where everything was a d20 system and rules became painfully bland, there is some lack of utility in being similar to but different than a new standard from the same company. Presumably, the rules presented are tied deeply into the concepts of the whole setting in a way to will prove meaningful enough to justify a new play format. These are your core abilities, rather than agility, strength, etc. The characters also have skills, ranging from law, to martial arts, to courtesy. Many of the skills are not what you would call your standard fantasy adventure game skills. Making a check requires rolling black ring dice, in addition to white skill dice. One for each point you have in the ring or in the skill. You may keep as many dice as you have values in the ring you are using. The versatility of the system is that it allows you to often parlay the way you are approaching something to make it something you are good at. For instance, if you want to knock someone down, you needn’t use Fire + Unarmed Combat (charging at them), you could instead nimbly dodge their blows, striking only with precision (Air+Unarmed Combat) or use their own momentum to throw them off balance (Water+Unarmed Combat). Some approaches are more effective than others. Exploding Successes: You count this as a success and then roll the die again, opting to keep this next roll as part of the first, or dropping it. These subsequent rolls can go on into infinity and aren’t counted against you as part of your ring limit. Opportunity: This works, as far as I can tell, like advantage in Genesys or FFG Star Wars, but perhaps with more restrictions depending on the type of ring you were using. Rules are skeletal here, and may be expanded on in the main book. Strife: This is emotion or stress that causes you to lose your cool. Unlike those other systems, there are no difficulty, challenge or setback dice. Also, strife appears along with positive dice results (like success, exploding success, and opportunity) thereby baiting the player to take those results. Strife isn’t the end of the world, but if it surpasses your Discipline result, you can become compromised, which precludes the character from using results that have strife on them (which really cuts your opportunities). That character can try to handle their situation until they regain composure, or they can become “unmasked” and clear their strife, usually with some loss of honor from their unseemly behavior. The game seems to have some potential, but as a new player to this version of the game, getting used to the idea of justifying your ring choice presented a little bit of a stumbling block. With some more play, I’m confident that the game will feel more natural. In some ways it encourages roleplaying the type of character you are to fit your actions, and rewards creativity. Dice in these games are always an issue. Many of my players immediately splurged on the dice app available on Google Play and Apple. These apps help to solve the problem of keeping track of what you previously rolled when you get a good run of exploding successes and start to run out of dice. With a game at this point in development, everyone would have to own a beginner box to have dice of their own, and that’s not going to happen. So it’s either pass those dice or get an app (for now). The game is more serious than a lot of other fantasy settings, as it deals primarily with the conflict between desire and duty. As such, L5R is likely to be a subtle game, and is really going to be the best fit with experienced gamers, or players that are naturally more serious and have a flair for the dramatic and the setting itself. Beer and pretzel gamers are probably less likely to enjoy the subtlety of the concepts and the balance required in the game play. In the past, I’ve always found the game a little tricky to prepare. The characters are almost by definition at odds where their houses are concerned, vying for influence in Rokugan, and that’s going to make things a little tense and maybe a little uncooperative. For that reason, it’s not going to be the game for everyone and it may be hard to prepare an adventure yourself with a party so divided. Fortunately, one can usually fall back on duty to guide the party to a common goal, even if they can’t agree on how to get there. Fantasy flight has released a free downloadable adventure and additional characters, which I have heard good things about. The map of the castle in the beginner box is for that adventure, and the characters are set to proceed with unifying purpose which originates in the beginner box, making it worth the quick playthrough. Total beginner box playthrough time is going to take from 4 to 8 hours. No word on how long the expansion material will take. This play time will be greatly enhanced by the GM reading the optional expansive rules book in the box and understanding those concepts before sitting down to play. TLDR: The Legend of the Five Rings Beginner Box teaches a subtle nuanced game to fans of the genre with minimal impact on players and GM alike, and is worth the price of admission for players who can’t wait for the full rules coming out in the months to come. The HeroForge Kickstarter just delivered two miniatures to my door and out of an arbitrary 10-star system, I would give them a solid six edging up to seven. I have been following and waiting patiently on the entire HeroForge idea since it was first announced. It is a system where you begin with a basic model (of which several are available) and customize it to your heart’s content. Male, female, robotic, halfling, human, dwarven and more… and then hundreds of options for equipment, poses, clothing, and sliding scales for things like musculature, height, curviness, expressions and so on. Hex bases, round bases, square bases. They have thought of everything and it’s really a lot of fun to make up different miniatures, and I highly suggest you go to the site and do so for yourself. I think I was hoping for more from the miniatures themselves, especially for the price. At $25 a pop, they are expensive. Does the customization justify the cost? I’m really torn. When “acceptable” Bones miniatures are in at $3 and $4 and higher end miniatures from DarkSword are $10… I’m just not 100% sure based upon the quality I have seen so far. I opted for the “high quality” prints and I was impressed with the overall process. You get in hand what you see on-screen. Very fine details abound. The sneery little halfling thief I wanted for my 5e Dungeons & Dragons Adventurer’s League games has his little sneery face and top knot haircut, a murderous little gleam in his eye. My hands-up pacifist cleric for our new Temple of Elemental Evil game has the perfect pose, the chiseled jaw, the lack of weaponry and the open expression I wanted. The customization is not the issue. I wonder that I personally may have had my bar set too high. While I was in on the Bones Kickstarters both times, I’m an old-fashioned kind of mini-painter. I like the metal. I think you get better overall miniatures and they paint up a lot nicer. In the photos, on the top you can see the HeroForge miniatures as they arrived. Oddly translucent (was not expecting that), they have a very ‘rough’ feel to them. I almost want to sand them all down, but then of course you’d lose all the details. That roughness is made very apparent in the bottom set of photos, where I have primed them. Metal miniatures (and even the Bones) are just plain smoother and seem like they will take paint better. On the HeroForge Facebook page there’s some definite “table-top” quality miniatures that have been painted. They look fine for using in a game… and isn’t that the purpose? As a new and emerging technology, 3D printing like this is surely going through some growing pains. I can imagine that come two or three years, the quality will skyrocket. I’m also relatively certain most people would give them more stars. I am just honestly worried to put paint to them… it’s not like I can easily and cheaply order another if I muck them up somehow. My Kickstarter pledge comes with one more miniature and a mounted miniature (which are not available yet). Stay tuned and in a couple weeks (after we get back from GaryCon!) I’ll have them painted up and show off the “final” product. 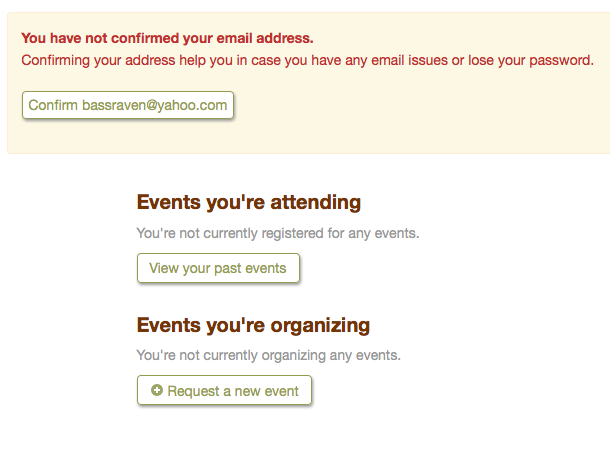 Warhorn.net is a great site for convention organizers and Friendly Local Gaming Store event planning. For the uninitiated, it can be a bit confusing to sign up, and reserve your seat at the gaming table. Somewhat recently the site went through a significant overhaul, with one main feature being that once you sign up for your free user account, you can use that same account for recurring game days at a FLGS or a yearly convention, like Asheville Comic Expo. 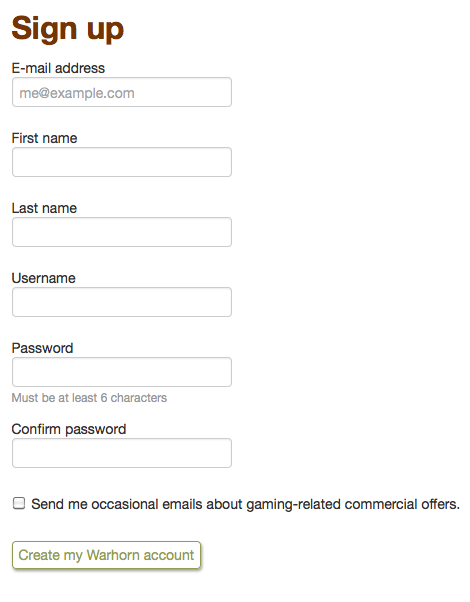 This is going to be a screenshot-heavy article, as I would like to detail the process on how you sign up for an account, and register for tables. 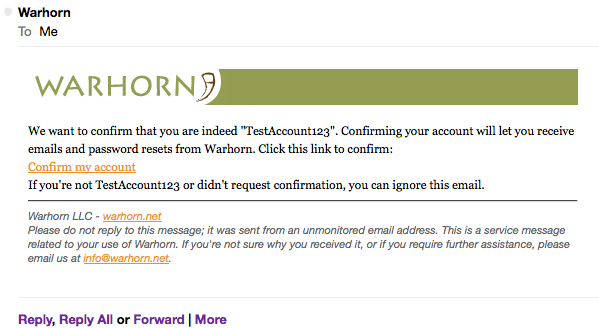 Once you sign up, keep your login credentials handy, and you can use them for any events organized through warhorn. You can even add your Pathfinder Society Number and DCI (WotC/D&D organized play) numbers that will follow your login from event to event, but let’s not put the cart before the horse. For both conventions and recurring game days, games are typically listed by start time, and title. Open tables will list a “Play” if you want to be a PC or “GM” button if you want to run that table. It also gives you the option to join a waitlist if the table is already full. If there is a no-show, you are in! 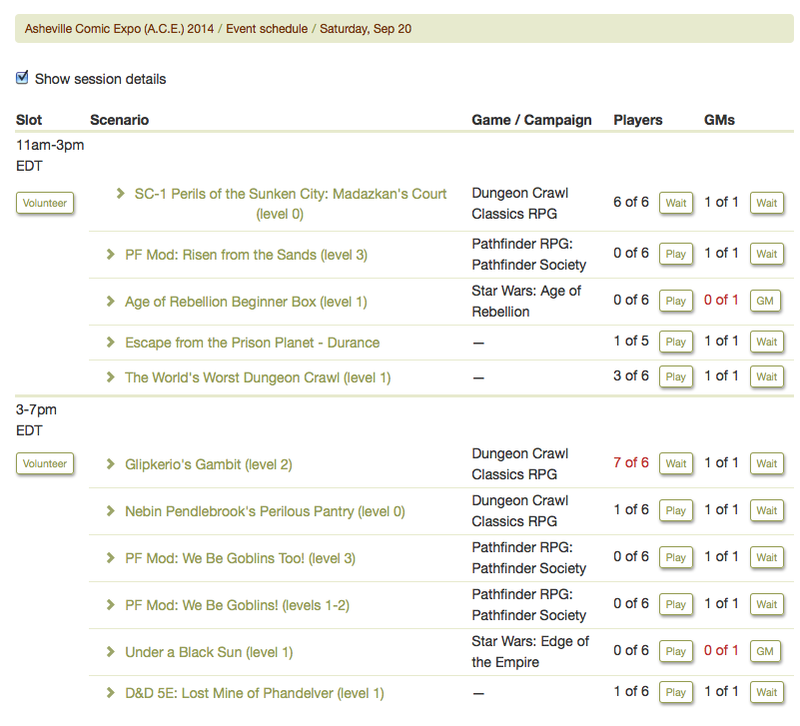 Be sure and check for recurring game days in your area as well, and support your FLGS! Hope this helps, and remember, once you’ve created your account you can use it for any conventions or game days organized through warhorn. 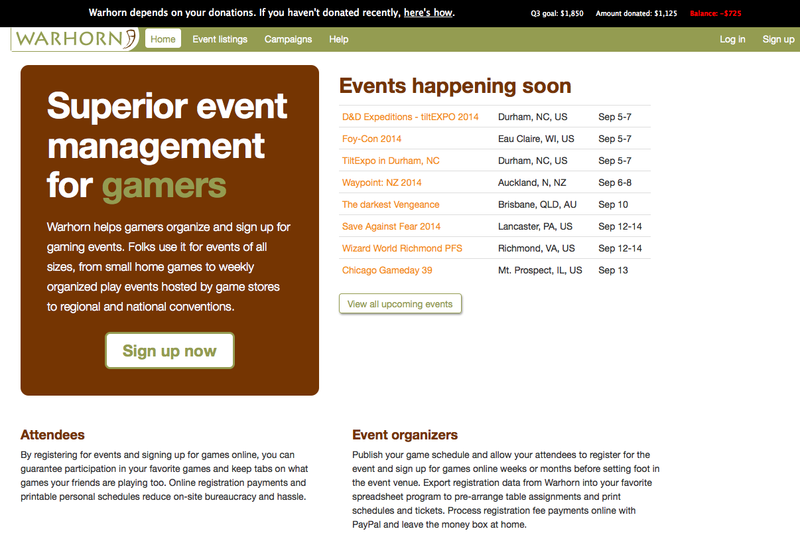 It’s also a great site to see events in your region you may want to travel for! In less than two weeks, the Skyland Games crew will be running the RPG tables for Asheville Comic Expo (ACE). Sign up at the warhorn, and we’ll see you around the table! Recently I’ve picked up a few games for the iPhone that started out as more traditional board or card games. A lot of them are great versions of the originals, with the added bonus of always being in your pocket, and allowing online games with friends who may not be able to make game night. They also tend to be a fraction of the cost of the physical board game. One of my favorites is Hive. I bought this first as a physical board game at the recommendation of the Wyvern’s Tale. Essentially it is like a game of chess, in which different bugs move in different ways, and the object is to completely surround the opposing player’s bee. This is one of those easy-to-learn, difficult-to-master games, and has won a ton of awards. It quickly became one of my favorite games, and the quality of the physical tiles is fantastic. They have a nice weight and are clearly built to last. Not sure if you’re crazy about the concept? At a list price of $32, that can be a lot for something you may or may not like. Why not try it out first? The $2 iOS version will teach you all the rules through a tutorial, has two player local or online play, as well as play against various difficulties of AI. If it becomes one of your favorites, you can always pick up a copy at your friendly local gaming store! Another one I tried out at a recent board game night was Fluxx. This is another seemingly simple game, that can great pretty crazy pretty quickly. The main goal is to collect “keepers” that match whatever the current goal card has on it. Keepers can be physical things, or concepts such as cookies, pizza, love, dreams, music, the brain, the rocket. The goals combine these like “Hearts and Minds” which requires both the brain and love, or “Dreamland” which requires both dreams and sleep. It’s kind of weird starting out, but you quickly get the hang of it. Other cards allow you to draw or discard more cards, or affect other player’s hands to try and get the keepers you need to win! There are a ton of expansions for Fluxx, The physical deck lists for $16, but if you’re not sure, the iOS version will only set you back $3. Quarriors is a dice and card game that requires a little more screen real estate than most, so is iPad only. I’ve had my eye on this at the game store for some weeks, but never pulled the trigger. I *do* love dice games, but I didn’t know if I would like this one or, (more importantly) if my wife would like it as she is often my co-player. At a list price of $70, I really wanted to be sure. In Quarriors you start out by rolling dice to give you Quddity, a type of currency you use during your turn to summon your minions or capture other dice that are available on the cards dealt for the game. The cards are either other minion or spells which boost or augment minions, quiddity, or how many dice you draw from your bag. Overall I think it is enjoyable, but not something everyone would be in to. Is it worth $70? I don’t know. Is it worth $4? Absolutely! I’ve heard some very good things about the iOS adaptation of Lords of Waterdeep, but haven’t picked that one up as of yet. Next time you are on the fence about a board game, try before you buy! There may be an excellent mobile version out there already! Recently, I started to really miss gaming with a group of friends who I had gamed with for years. We started together playing Living Greyhawk,and that branched out to many games and systems. We would play at different people’s houses, at libraries, one year we all travelled together and played GenCon and when I became “Triad” for the Florida region of Living Greyhawk, they helped me run conventions locally. We would play anywhere and everywhere we could. But then Living Greyhawk dissolved, I took a long break, and the group scattered. We had used roll20.net locally when a blizzard struck and we couldn’t get our Reign of Winter campaign folks all together. We had also used it to roll DCC characters and magic items, utilizing the free dice rolling utility in preparation for a week day game. For some odd reason it had never occurred to me to try and corral everyone together for a game until that point, but I’m glad it did. We’ve used it now a handful of time and now have a weekly game happening every Tuesday night. I sprang for the “Mentor” level of sponsorship so that we can get all the bells and whistles that roll20.net has to offer. They have really upped the bar over tabletop and, as odd as this may sound, I almost prefer it to face-to-face gaming. Almost. The “Dynamic Lighting” feature alone is worth the very low per-month charge. You can set each player’s “token” to their specific mode and strength of sight, assign someone to carry the torch (or light spell) and if that person moves away…? Well, then the rest of the party can’t see who is lurking in the cave or in the belly of that ship. If you prep beforehand, it takes into account line of sight, shadows, walls blocking the view… they have really thought of most everything. Macros, character sheets and click-to-roll buttons, sound effects, background music… it’s fantastic. It does take longer to prep for a game, since you have to hunt down tokens or artwork, scan and size maps (which can be a pain) and scan in any handouts, puzzle pieces and so on. We use a Google+ hangout as well, since we found the voice and video to be buggy. Those quibbles and workarounds aside, it’s a great service and one I am happy to promote and support. There is a large group of people using roll20 to organize on-line Pathfinder games, and the roll20 forums are filled with people looking for more players… so if you find yourself with some time to spare, check it out and give it a try. I now present Adrian Redfeather’s alternate persona while adventuring with the Pathfinder Society; Lady Redfalcon. To disguise himself from his father’s peers and keep his identity an upmost secret, Adrian decided to make over himself the most drastic way he could think of; as a woman. Borrowing a pair of fighting fans from his father’s collection of the Far East along with a kimono that was given to his mother and a long, black-haired wig, he is incorporating them into his new persona. Drawing upon skills learned from his father, Adrian is able to combine aspects of rangers and rogues to create the mystique of the shy and demure, yet positively deadly, woman known only as Lady Redfalcon. I want to thank everyone who voted for voting. I think this was kind of an interesting process that I will definitely have fun with the results. Thank you all again!